In a report which the author prepared for the International Egg Commission (IEC), the history of global egg production between 1962 and 2012 was documented. It could be shown that the success of market-oriented egg production, which began in the early years of the 20th century, was based on technical innovations in housing systems, new ways in layer breeding and achievements in the development of vaccines against the most dangerous diseases in poultry production. It also became obvious that the future of laying hen husbandry and egg production will depend on innovations in breeding, feeding and the control of highly infectious diseases, but also on answers of the industry to the new challenges of animal welfare and sustainability. Presently, the egg industry seems to have reached a threshold regarding the future of housing systems. Conventional cages are prohibited in the European Union (EU) since 2012 and in California since January 1st, 2015. The banning of conventional cages in the EU initiated a transformation in housing systems in all member countries. 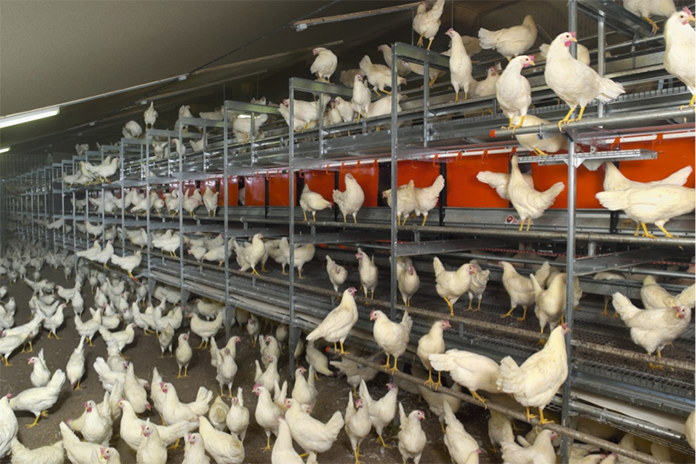 Furnished cages, colony nest systems, barn and free range systems spread within a comparatively short time period and changed the picture of laying hen husbandry in large parts of Europe considerably. 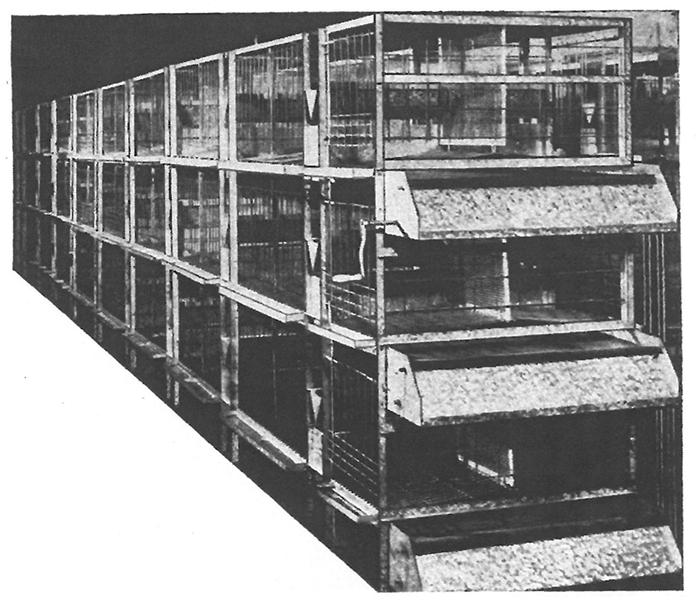 The step from conventional cages to alternative housing systems initiated similar dynamics in other parts of the world, especially in the USA, Canada, New Zealand and Australia. In this first part of this report it will be analysed how the housing systems developed from small flocks kept on farms via first market-oriented production systems to battery cages in the 1960s. It will then be documented how the criticism of intensive egg production in large herds and confined buildings led to the banning of conventional cages in the EU and the development and dissemination of alternative housing systems not only in Europe but also in other parts of the world. Then, the existing housing systems will be classified and characterised in detail. It will be distinguished between conventional cages, furnished cages, barn systems with and without outdoor access. The second part of the report will deal with the advantages and disadvantages of the housing systems under animal welfare aspects. Then it will be given an overview on the present situation of housing systems in the EU and global egg production. Despite the enormous amount of literature which is available on layer breeding, egg production and animal welfare aspects there are only a few studies which deal with the history of housing systems. Elson (2011) distinguished between four periods of the development of housing systems. He characterised them as: Historic Period (before 1914), Traditional Period (1918 – 1953), Conventional Period (1953 to late 1990s) and Modern Period (1990 to the present). The author of this report also distinguished between four periods (Windhorst, 2014) which he characterised as: (1) The early days, (2) The beginning of modern egg production (1930 – 1960), (3) The time-spatial dissemination of intensive egg production between 1960 and 2000 and (4) from 2000 to the present: animal welfare and sustainability, the new driving forces. The following analysis will be based on the latter classification. About 100 years ago and in some countries even until the 1940s, eggs were mainly produced in small flocks kept on thousands of farms in Europe, North America and in other parts of the world. This is still the case in many threshold and developing countries. Most of the time, the laying hens could roam in the farmyards during the day, foraging on seeds, waste grain, insects and worms. The nights they spent in small shelters or hen houses where the nests were also located. The eggs were either used on the farm or sold to local stores or travelling traders. Egg production in this housing system was not very efficient. On small farms, where the hens were not selected, a hen laid between 70 and 80 eggs per year, on farms with larger flocks and a better housing and management, the laying rate may have been as high as 120 eggs. As most of the small hen houses were not heated and lighted in winter, egg production almost stopped. A serious problem were diseases, the mortality rate often reached 20 % or even 40 % as Brown (1930), Arndt (1941) and Eriksen (1974) document. Parallel to these extensive forms on mixed farms, market-oriented egg production started in larger units, mostly close to cities. If kept in larger units, disease problems obviously reduced the economic success considerably because of the high mortality. There is, however, not much detailed literature available on the economics of egg production in those early days. The beginning of modern egg production in larger flocks can be traced back to the first years after World War I. The main steering factors were the migration from rural areas into cities, new ways of marketing eggs in stores and the introduction of more efficient forms of egg production, closely related to new housing systems. Such systems developed in the USA as well as in England in the 1930s. Several poultrymen experimented with keeping laying hens in cages. Cages had been used in battery brooding (Arndt 1931) of chicks and turkeys even before 1930. Wilson (1974, p. 221) reports that the development of intensive poultry raising in the USA started in California because of the favourable climate. But as early as 1941 more than 500 different designs for poultry houses were available, adjusted to the geographic regions of the USA and their peculiar climatic conditions. Milton Arndt (1931) was one of the first poultry breeders and egg producers who started keeping laying hens in cages. The first experiments were not very successful, however, because the birds after only three weeks became cripples and could no longer stand on their own feet. The cause was a disease (rickets) which resulted from a lack of vitamin D.
Once the reason was detected, cod liver oil was mixed to the feed and the layer could be kept in cages for a whole laying period. Within a short time, one-tier und multi-tier batteries spread in the western and southern part of the USA. In Orange County (California) simple one-tier cages, only protected by a shade from sun and rain became popular. Such systems were also used in the south-eastern states. But these housing systems could not be used in other parts of the USA with a humid climate and cold winters; there cages had to be installed in confined buildings. Milton Arndt was far ahead of other poultrymen in the late 1930s and early 1940s. He was aware of the advantages of keeping the laying hens away from their droppings, because the mortality rate decreased considerably. He could also produce cleaner eggs and reduce the necessary labour input. At the beginning of his experiments he only kept one hen per cage but soon realised that he could get the same results with two or three birds per cage. In the second edition of his book Battery Brooding he wrote (1941, pages 311-312): “There have been some very radical changes made in the construction of laying hen batteries since I first started my experimental work on this system on a commercial scale four years ago. Various features found to be necessary in this type of battery have been added from time to time to increase the efficiency of the unit and in my most modern battery experiment wire bottoms have been used with great success. The object of this modern feature is to automatically remove the egg from the cage as soon as it laid. Watering the birds and feeding the birds has been greatly simplified and the latest models of hen batteries are equipped with special rubber belts so that the droppings can be removed in the shortest possible time. The use of these modern belts eliminates the hardship of using numerous dropping pans and scraper arrangements which have not proved satisfactory owing to their unsanitary features”. At a first glance it is surprising that this innovation (Figure 1) did not spread faster in spite of the increasing demand for eggs. But the reason was the shortage of metal during World War II which stopped the further development and dissemination of this housing system (Wilson 1974, p. 223). World War II obviously also stopped the spread of the so called “automatic feed chain” which was invented by the De Witt brothers in Zealand (Michigan) as early as 1938, but the innovation was not marketed as a functioning feeding system to egg farmers before 1948. From then onwards it spread very fast in the USA and came to Europe in the early 1950s. Metal and wooden cages were also developed in England in the 1930s. 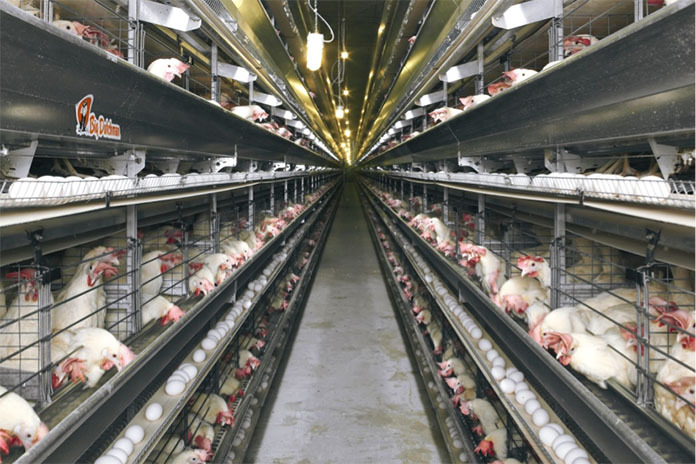 In contrast to the comparatively simple systems in California and the south-eastern states of the USA, battery cages with automated collection of the droppings as well as watering were built and installed in England in series. The climatic condition on the British Isles resulted in other technical solutions than in the USA. Confined buildings with multi-tier batteries reduced building and heating costs. A first farm of this type for 2,000 laying hens was built close to Bern (Switzerland) in 1935 and was operated until 1960 (Ebbell 1967, p. 5). Despite the success of this farm, the housing system was, however, not well accepted on the continent before the early 1960s. Most of the laying hens were still kept in barns without windows. Nests were mostly located at the outer walls. Manual feeding and egg collection as well as cleaning the houses after the laying period resulted in high labour costs. The flock size ranged between 200 and 500 birds. With the introduction of the automatic feed chain which reduced the labour input, larger flocks (up to 10,000 birds) could be kept (Figure 2). At the beginning of the 1960s, two innovations which would change laying hen husbandry and egg production thoroughly over the following decades were available, a hybrid laying hen with a high laying rate and a robust health and a mechanised housing system in which these hens could be kept. These two innovations together spread very fast. In 1972, already 80 % of the layers were kept in cages in Germany (Windhorst 1979). It started with so called flat-deck-systems which, however, were soon substituted by multi-tier batteries. Already in the early 1960s flat-deck systems were combined with the automatic feed chain which considerably reduced the necessary labour input . Beside one-tier flat deck systems also two or three-tier A-frames (Figure 3) were installed, but they never reached the same share in Europe as in the USA. 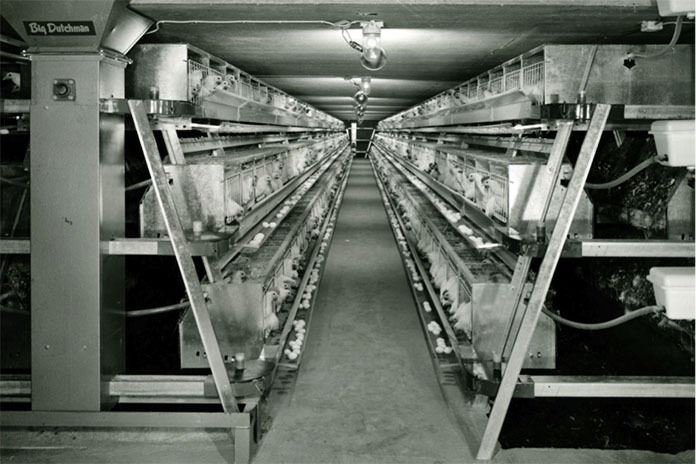 In the early 1970s, mechanisation of egg collection and sorting were combined with battery systems. In 1980, batteries with manure belts were offered to the egg industry, from 1996 onwards they were aerated to reduce the moisture of the droppings and fly problems. Cage systems disseminated also very fast in the U. K. In 1966, about 90 % of all laying hens were kept in cages; in 1985, a peak with 95 % was reached (Elson 2011, p. 19). A similar share showed the USA and Canada. 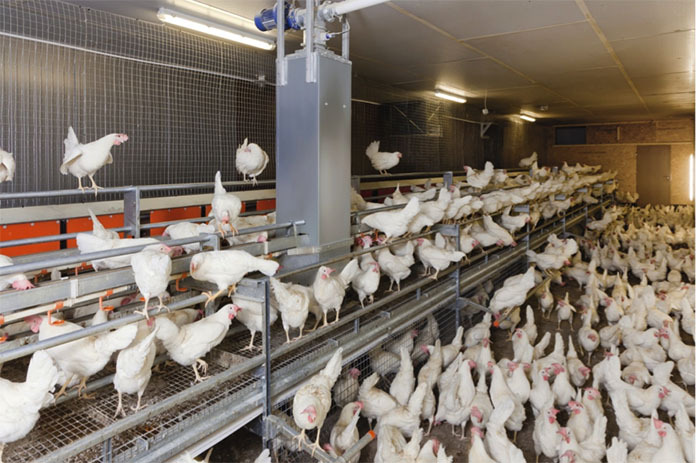 The rapid spread of these systems was mainly due to lower production costs because of a better feed conversion and lower labour input, the considerable decrease of the mortality rate as a consequence of a higher hygiene status in the hen houses as well as cleaner and less contaminated eggs. Vertically-integrated agribusiness companies with several million layers developed in Europe, North America, Japan and Australia. The economic success resulted in a transfer of these housing systems to threshold and even developing countries from the late 1980s on, i. e. to China, India and Mexico, but also to countries in Northern Africa and in South America. Parallel to the installation of large-scale egg companies with cage batteries and the formation of agribusiness companies, the opposition against this intensive form of laying hen husbandry and egg production began to be expressed by animal welfare groups and political parties, such as the Green Party in Germany. 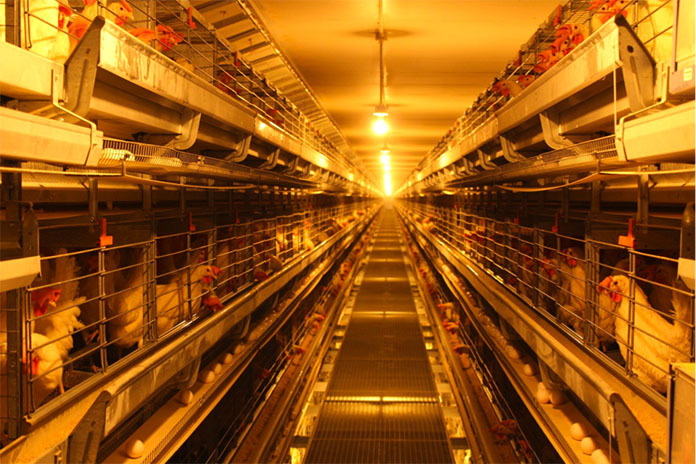 The first country to step away from keeping laying hens in cage systems was Switzerland. After years of intensive studies dealing with the advantages and disadvantages of cage batteries, this housing system was banned from 1992 onwards. New forms of keeping laying hens had to be developed. Several companies offered aviaries and floor management systems which were not only sold in Switzerland but also in other countries, especially after the decision of the EU Commission in 1999 to ban conventional cages in all EU member countries from 2012 onwards. This decision was a reaction to the growing opposition in several EU member countries, especially Austria, Germany, Sweden and the United Kingdom. Looking back to the beginning of cage systems in the USA and England one has to state that this housing system, at least in its conventional layout, more or less dominated egg production from the mid 1960s to the early years of the present decade, i. e. for about half a century. The passing of directive 1999/74/EC by the EU Commission in 1999 initiated a new phase of laying hen husbandry and egg production. This directive laid down minimum standards for the protection of laying hens. In this directive it was decided that from 2012 on conventional cages would be prohibited in EU member countries and from 2003 on such cages could no longer be installed. Officially, the transformation process was completed in December 2012 even though it was challenged that all countries had met the deadline in due time. The European animal welfare discussion was transferred to other countries and presently the banning of conventional cages within the next ten to fifteen years has been decided in Canada and New Zealand and is being discussed in several other countries such as the USA and Australia. A particular situation exists in California where conventional cages were banned from January 1st, 2015 on (c. f. Windhorst 2014). It is worth mentioning that even in several developing and threshold countries the animal welfare discussion is gaining in importance, some of these countries already implement enrichable cages  according to the EU directive to be able to export eggs into the EU, i. e. Turkey, Argentina and Morocco. The EU directive initiated the development of alternatives to conventional cages, such as aviaries or litter-based floor management systems. One of these alternative systems is the colony nest (Kleingruppenhaltung in Germany). It is a small aviary in which 40 to 60 hens can be kept. This system has been installed in several farms in Germany, the Netherlands, in the UK and in California. If it will further spread in the USA and other countries is a still open question. The advantages and disadvantages of the various housing systems were studied intensively. Excellent overviews give the publications of the work packages of the LayWel-project of the EU (2006), the “Code of Welfare for Layer Hens”, published by the Ministry of Primary Industries (New Zealand) in 2012, and the Review of Scientific Research on Priority Issues for the “Code of Practice for the Care and Handling of Pullets, Layers and Spent Fowl”, published by the Canadian National Farm Animal Council in December 2013. 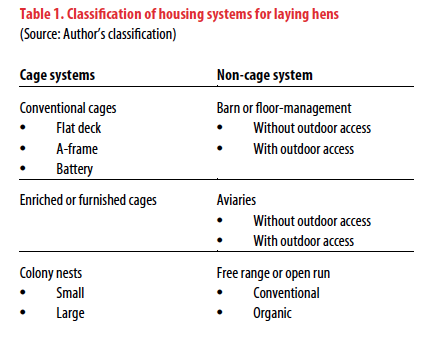 A general classification of the housing systems can distinguish between cage- and non-cage systems (Table 1). The class of cage systems can be further classified in conventional cages, enriched or furnished cages and small and large colony nest systems. In the class of non-cage systems, one can distinguish between barns or floor-management systems, aviaries and free range resp. free run systems. Detailed and reliable information on the global distribution of these systems is only available for the EU member countries and several IEC member countries outside the EU, based on the data supplied by the rapporteurs. These data will be presented and discussed in the second part of this report. 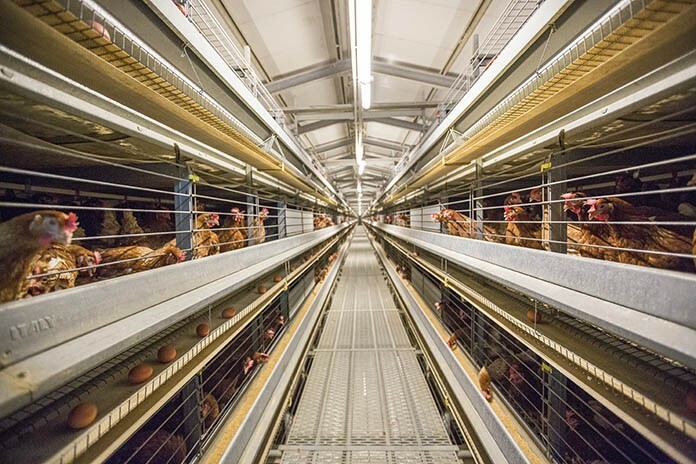 Conventional cage systems comprise housing systems in which the laying hens are kept in enclosures with welded wire mesh sloping floors. The cages can be of different size according to the number of hens which are kept per cage. In the early decades of the 20th century, this system often started with only one hen per cage, later on, up to seven hens were held in one cage. Such cages provided the hens with equipment for feeding, drinking, egg collection, manure removal and the insertion as well as removal of hens and sometimes devices for claw shortening. In the early phase, feeding, egg collection and manure removal was done by hand; in younger systems these tasks are fully automated. 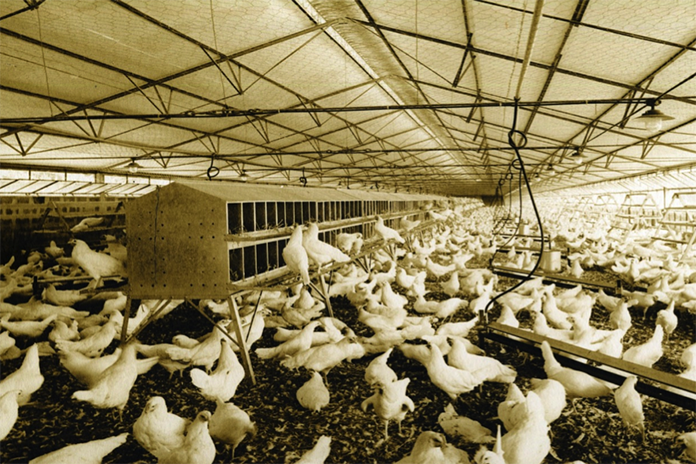 Even though Milton Arndt (1931) as well as poultrymen in England already used multi-tier cage systems, flat-deck systems with only one tier were frequently used in California and also in continental Europe in the 1960s. Two or three-tier A-frame systems (see Figure 3) substituted flat decks in the USA as well as in Europe in the late 1960s and early 1970s without, however, making the older system obsolete. Both systems were partly or fully automated. Manure was mostly collected underneath the cages, in the USA often in deep-pit houses where the manure could stay for several years before it was completely removed and the pit cleaned and disinfected. These houses very often had severe fly problems. Cage-batteries were continuously improved in the 1970s and 1980s. The battery systems which are used presently in market-oriented egg production are equipped with automated feeding, drinking, egg collection and manure removal equipment. Such systems can have between three and eight tiers, some egg farms may even have more (Figure 4). The space which is available for the hens in conventional cage systems can vary between 430 cm2 and 560 cm2. In some threshold and developing countries the available space per hen may be even smaller. 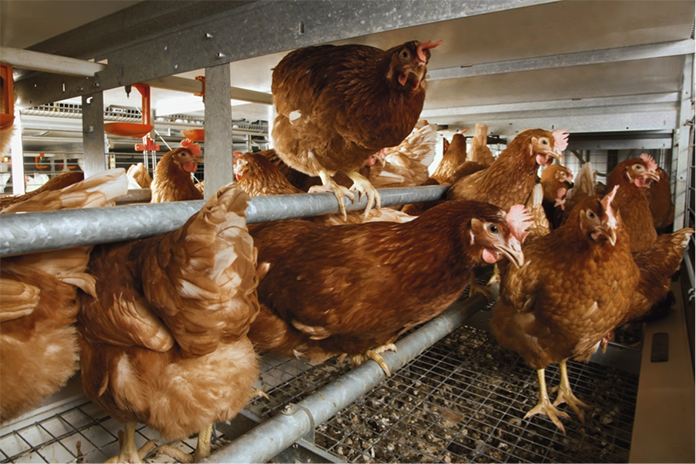 Furnished or enriched cages show the same basic equipment as conventional cages. In addition, they are enriched or furnished with additional equipment which allows the fulfilment of some of the natural needs of the laying hens. The additional elements include perches, nest boxes and a litter area which permits dust bathing and scratching. Depending on the legal regulations, the cages may offer more height than conventional cages. This housing system was developed after the banning of conventional cages in the EU by directive 1999/74/EC and has also spread to some countries outside the EU in recent years. Colony nests were developed in Germany in a model project financed by the egg industry and equipment companies between 2000 and 2004 as a reaction to the regulations in the EU directive 1999/74/EU. Various types of “Kleingruppenhaltungen” were tested by scientists of the Veterinary School of Hanover and the Federal Research Institute for Agriculture in Braunschweig. The colony nest systems offer more space to the laying hens (800 cm2 for lighter hens and 900 cm2 for heavier hens) and are higher to allow perches on different levels (Figure 5). Colony nest systems are presently offered for a variety of group sizes. Systems with up to 30 birds are generally referred to as small colony nest systems, larger group sizes (up to 80 birds) are referred to as large colony nest systems. Even though this housing system was developed in Germany, it is presently mainly used in the Netherlands and in the UK. Outside the EU, a farm with large colony nests was also built in California (Figure 6). In Germany this system will be substituted by barn systems within a few years because the food retailers no longer list eggs printed with a “3”, which stands for cage systems. 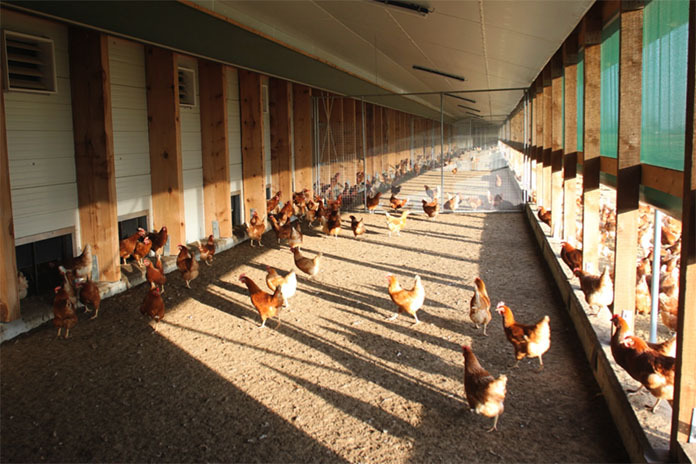 Non-cage systems are housing systems without confined devices which are operated by the keeper from the inside of the building and which allow the laying hens the fulfilment most of their basic natural behaviour. Barn or floor management systems (Figure 7) can be either pure indoor systems or may be combined with outdoor facilities (Wintergarten). They are always one level systems in which the ground floor is either covered totally or partly with litter, or systems with perforated floors (mostly welded wire mesh). In the latter systems, the droppings fall through the perforated floor. The laying hens have no access to the collected manure underneath the floor. Nests are in most cases placed at the outer walls. Feeding and drinking equipment can be arranged in various forms. Aviaries (Figure 8) are always multi-level systems. Besides the ground floor, several levels of perforated floors are arranged in such a way that the droppings cannot fall on the birds roaming on a lower level. In modern systems, manure belts are installed underneath the perforated floors. Feeding and drinking equipment is arranged in such a way that all hens have an easy access to both elements. Nest boxes can be either arranged separately along the walls or integrated within the blocks of perforated floors. Aviaries can also be arranged as pure indoor systems or as systems with outdoor access. The latter can be a covered and enclosed winter garden which prohibits wild birds or predators to enter the housing system (Figure 9). Outdoor systems can either be conventional free range (or free run) systems or organic systems. They only differ in the stocking density within the hen house. While conventional systems in the EU allow a stocking density of 9 birds per m2, organic systems only permit 6 hens per m2. 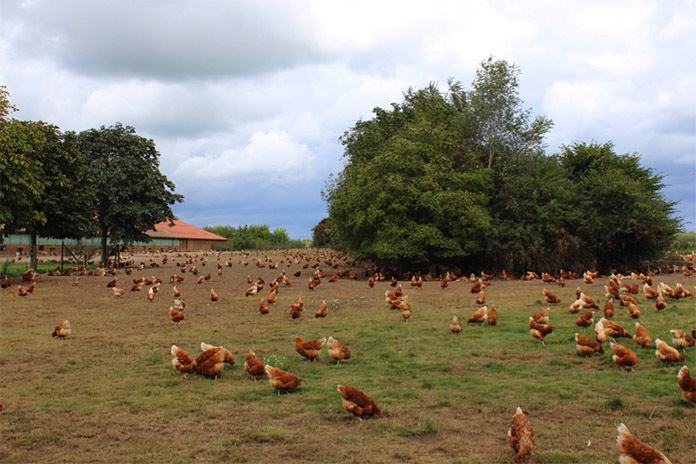 The available outdoor space in both systems is 4 m2 per laying hen or a maximum of 2,500 birds per hectare. The outdoor range can be available for the hens either directly through openings in the walls or via the covered winter garden (see Figure 9). The outside area is mostly covered with grass and should offer trees, bushes or shelters to protect the hens against predators, rain, bright sunshine or cold (Figure 10). “Enrichable cages” means that the cages have the size which is demanded in EU directive 1999/74 but they are not fully equipped with nests, perches etc. But they can be furnished as soon as an egg company plans to sell eggs to a EU member country in which food retailers demand that eggs are produced according to the regulations of the EU directive. The term “winter garden” is derived from the German word “Wintergarten”. In everyday language it is used for a covered additional room, mostly enclosed by windows, which is attached to the house. It was very often used to protect non-frost-resistant plants from frost during the winter months. In poultry husbandry, the term is used for a covered attachment alongside the hen house, mostly enclosed by welted wire mesh. The term was first used in scientific reports in the LayWel project in 2006.